What does this have to do with a book of poetry titled A Cold Wind from Idaho? Those Americans familiar with the Pacific Northwest Japanese American World War II experience will understand the imagery wrought by the title as being both evocative and apt. The metaphor of freezing winter winds chilling the body and then entering the soul of those affected conveys fittingly how the Japanese Issei and Japanese American Nisei encountered, braved, and then survived the cold iciness of Idaho’s winters while they were huddled in a primitive American barbed wire concentration camp. Larry Matsuda was born in the Minidoka, Idaho War Relocation Center during World War II. He and his family along with 120,000 Japanese and Japanese Americans were held in ten concentration camps without a crime and without due process for approximately three years. His poems appear in Poets Against the War website, The Raven Chronicles, New Orleans Review, Floating Bridge Press, Cerise Press and the International Examiner Newspaper. He lives with his wife, Karen, and son, Matthew in Seattle, Washington and is a consultant presently helping to re-design schools as better physical learning environments. He was a junior high language arts teacher and Seattle School District administrator and principal for twenty-seven years. before he shipped out to Italy. Todd, her first son, volunteered. before she could finish his. for a bullet to find. to touch her son once more. "A Cold Wind from Idaho is the logical next step for Matsuda in his evolution from a community activist to a writer pursuing social justice issues. Because of my internment experience during World War II, the poems brought back memories and gave me another perspective to better understand the tragedy of the Japanese internment." "Some pains take lifetimes to assuage. 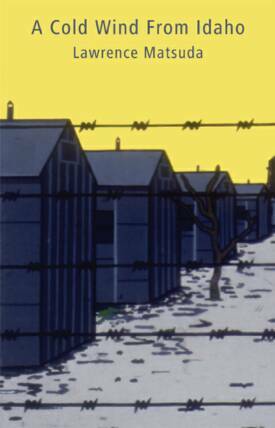 Matsuda’s poems break for us all the Japanese-American code of silence (gaman) toward the indignities of the nine U. S. government-mandated internment camps of WWII like Minidoka in Idaho where Matsuda was born. He not only educates us in the specifics of the suffering of this time, but also brings us into the transgenerational implications of it, connecting this shameful period to both the war in Iraq and the bombing of Hiroshima where one of his relatives survived near ground zero. We have had an appointment with this book for a long time. I’d say it’s an American necessity to read it . . . I could not put the book down. It’s why I love poetry: its power to change hearts and to educate our souls."